TAZEWELL, Tenn. - David Payne swept into the lead with four laps left to go in Sunday night’s Buddy Rogers Memorial at Tennessee’s Tazewell Speedway, and went on to score the Schaeffer’s Oil Southern Nationals Bonus Series victory. Payne, from Murphy, North Carolina, inherited the lead from Toccoa, Georgia’s Casey Roberts when Roberts suffered a flat tire with four laps to go. From there, Payne would go on to record the win and the $4,400 payday. Roberts took the lead on the drop of the green flag from the outside of the front row, with Vic Hill in pursuit. Roberts would hold the lead through the first caution flag, when Kenneth Howell slowed in the second turn. On the restart, Roberts maintained the lead, with Payne moving up to second place. Caution flew again on lap 22 as Chicky Barton, Brian Smith, and Jeff Neubert would tangle in turn one, ending Neubert’s night. Back under green, Payne began working the middle and bottom grooves in an attempt to find a way around Roberts. The two would battle their way through lap traffic, with Roberts able to hold off Payne’s advances. The caution flew again on lap 40 when Barton spun, with Roberts making slight contact with Barton’s spinning machine. That resulted in a cut right rear tire for Roberts, sending him to the pits. Payne inherited the lead, and went on to the victory. Hill finished in second, with Dakotah Knuckles in third, Chad Ogle in fourth and Tommy Bailey in fifth. Todd Coffman, Clyde Overholt, Aaron Guinn, Brian Smith and Joey Standridge rounding out the top ten. 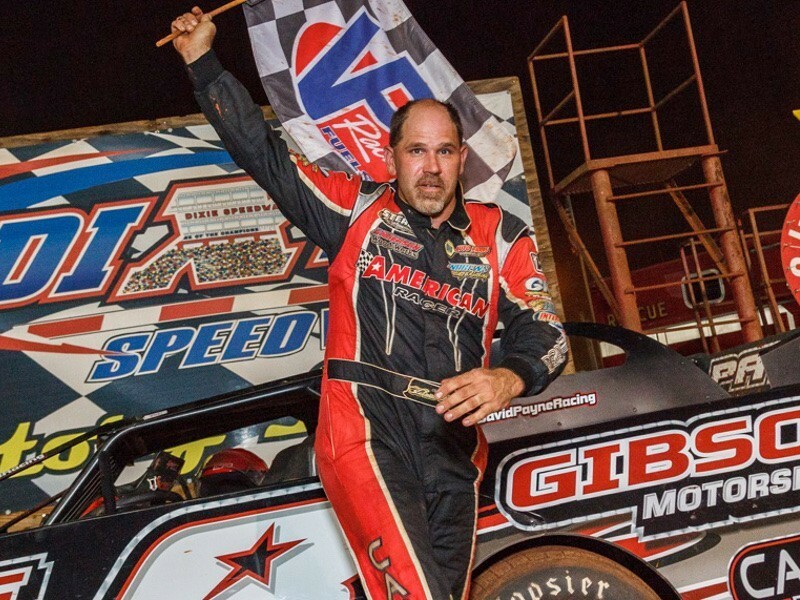 The Schaeffer’s Oil Southern Nationals Bonus Series returns to action on Saturday, September 15 at North Georgia Speedway in Chatsworth, Georgia. For more information, visit SouthernNationalsSeries.com. David Payne, seen here from an earlier win, scored the win in Saturday night's Buddy Rogers Memorial for the Schaeffer’s Oil Southern Nationals Bonus Series at Tazewell Speedway.